I love those free city maps you get at the tourist info center at the airport. It’s one of the first things I look for coming to a new city, that and ATM machines. 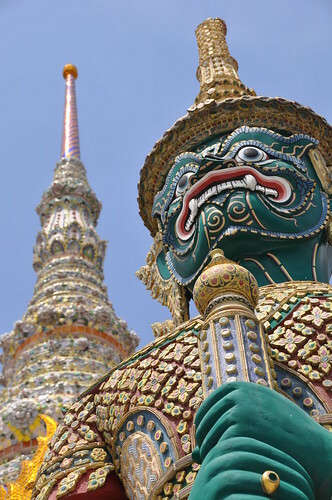 Bangkok has like a billion different kinds, we chose the one that’s called “The Official Map Bangkok”. How can you go wrong with that? 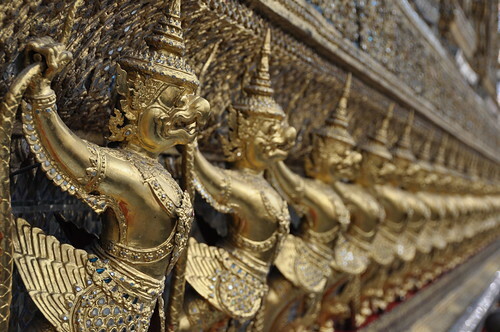 Taxis are one of the most abundant things you can find in Bangkok. They’re painted bright candy colors that brighten up the streets. Taxis are relatively cheap and most drivers speak good English. They are also mostly honest, actually we’ve only encountered 1 driver who tried to negotiate fix rate. Flag down is 35B for 2km then 5B/km. Just say no and move to the next one. Buses and MRT are also available but because we were 4 people traveling, taxis were good option for us. 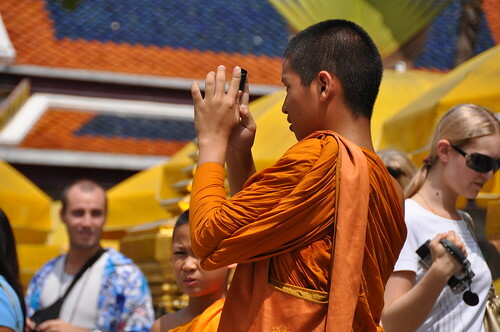 Tuktuk are nice and exotic but be very careful as they are probably the worse tourist trap in the city. Opening price is always way, way too high. If they call 100B, you can for sure get it at 30B. In the new found it funny how ridiculous they were but later it is a little bit irritating. If not for Pincky and Girlie whose legs weren’t meant for walking unless done inside a mall, we wouldn’t be taking them at all. With the help of the map, we were able to strategically schedule our day. 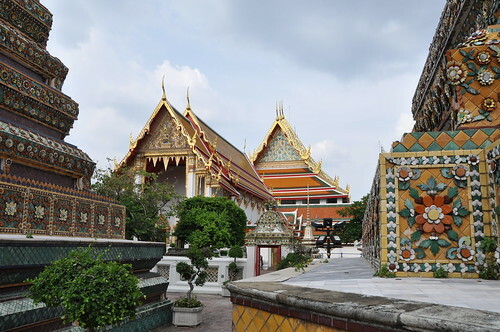 We headed west to visit the old city along the Chao Phraya River. We took hotel taxi who charged us 200B. Too freaking expensive but it’s ok, you live, you learn. The rest of the trip, we will be dealing only with city taxis. 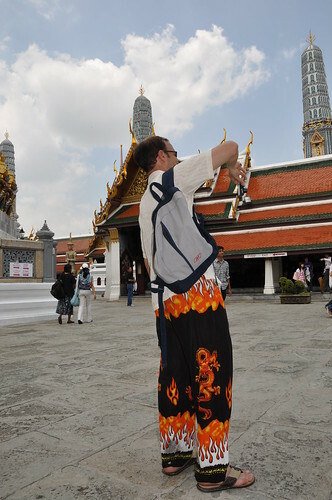 Going into the temple is free but proper attire should be observed. 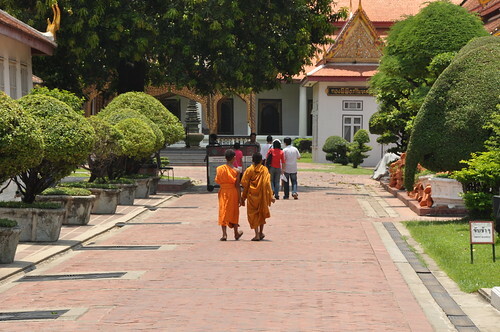 Bare shoulders (except if you’re a monk in yellow robe) and legs (no shorts or capris) are not allowed entry. 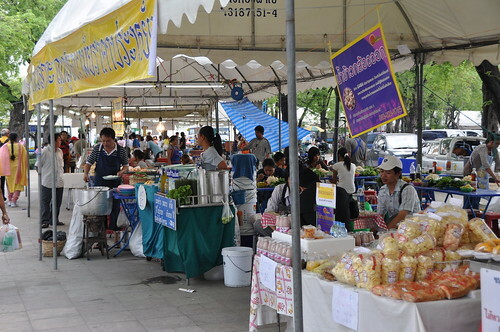 Enterprising Thais outside would rent out colorful sarongs for 50B + 50B deposit. We knew this before coming but with 38 C in the city, we couldn’t stand wearing jeans (except for Pincky) the whole day. I also read about the rental that’s why we came in capris. Bejeweled!! This is the adjective that comes to mind going into the compound. 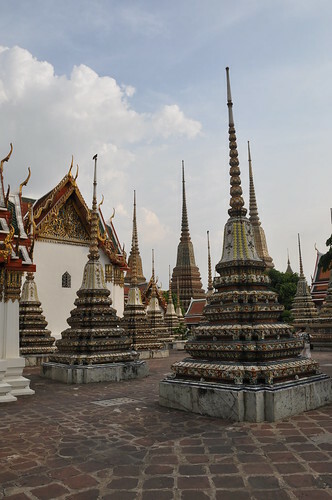 It contains many highly decorative pagodas, buildings, and statues. 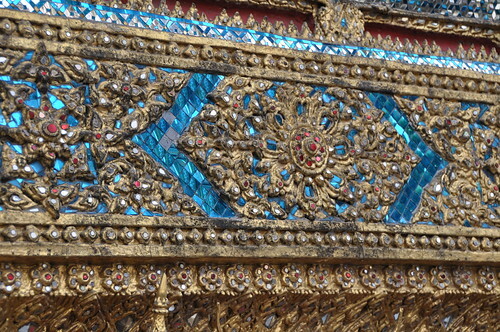 The trimmings in these structures are more intricate and complicated than a queen’s gown. The exaggerated design and details are beyond words. So please just take a look at the photos. It was noon time and the blazing sun was melting my 2 sisters so after a few, we decided to go and find something to eat. We were clueless where to. There were a billion of tuktuk outside offering rides. We asked them where is the nearest food place. 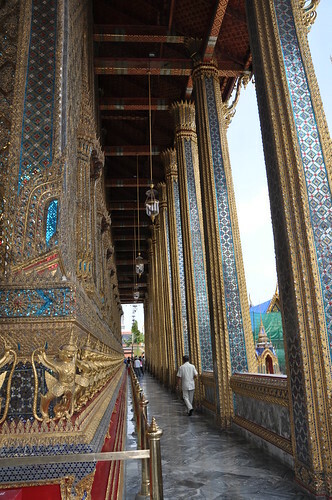 One said for 20B they’ll take us to Pratunam. Pratunam?! According to him, there is NOWHERE to eat around the area. Right, all these tourist spots and no restaurant nearby. Exasperated, we walked. 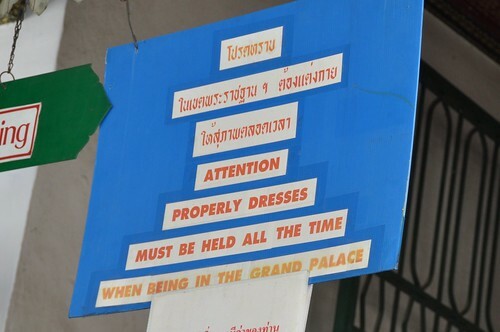 Thai and they understand no English. But with a lot of pointing and actions, and their warm friendly nature, we had one of our nicest meal in Bangkok, and it costs us 170B. Noodles and cokes and ice coffees. 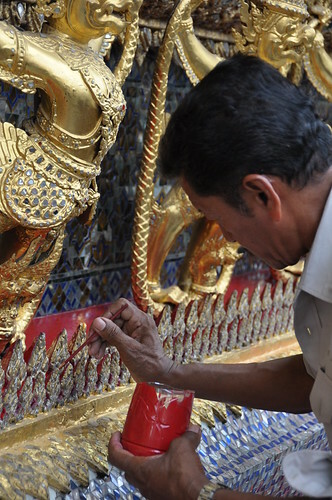 This is another important temple in Bangkok. 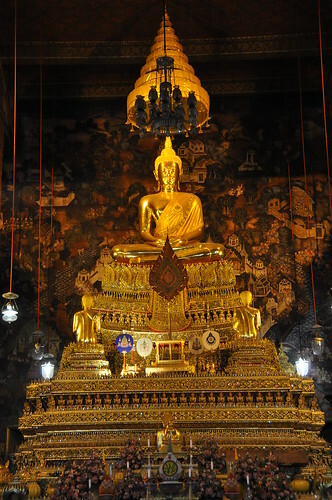 It’s the biggest, oldest, and has the most number of Buddha images (over 1000). 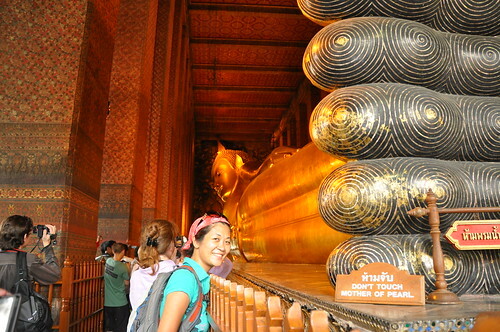 Its most popular being the 42m reclining Buddha covered with gold plate and trimmed with mother of pearl (eyes and feet). 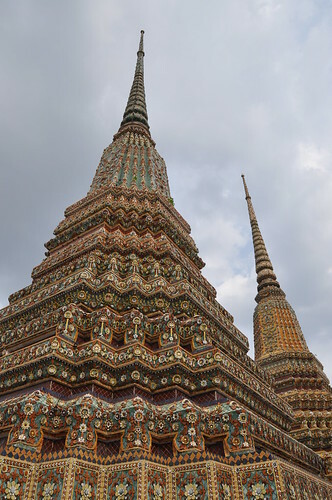 The pagodas and structures are also highly decorated mostly with colorful ceramic. 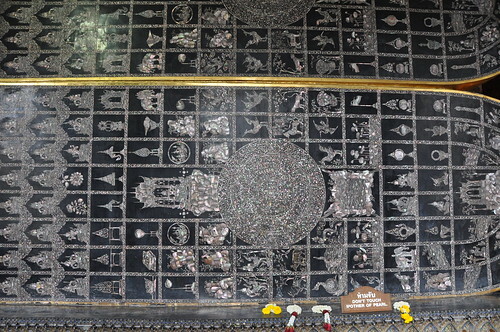 The design and details are also very intricate you’d think that perhaps the monks lay tiles during prayers instead of beads. It’s so huge that I almost got lost inside. 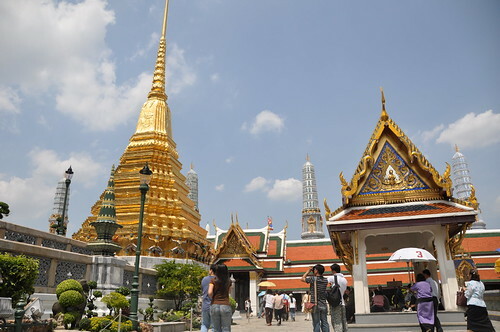 There’s another important temple in Bangkok (Wat Arun) but it’s already 5pm and for sure the temple is already close. It is also across the river and my sisters were already complaining that they’re all same, same. I disagree of course, but I will have to come back next time. Anyway, we have a Thai Boxing match to catch at 20:00.
thanks Candie, Dorothy! I’m glad u like my entry and photos. Click on the Flickr widget for more photos :) Please check back again soon. Thanks. I thoroughly enjoyed browsing through your beautiful collection of photos. Thank you for bringing me into another world for even a moment! 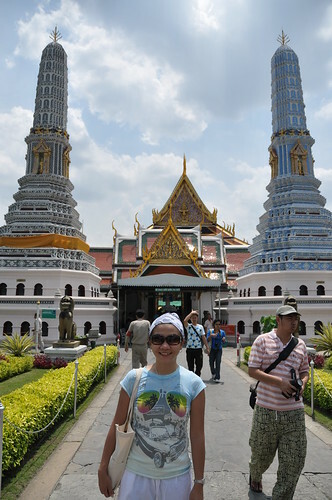 the temples are amazing… i almost cried just looking at them! 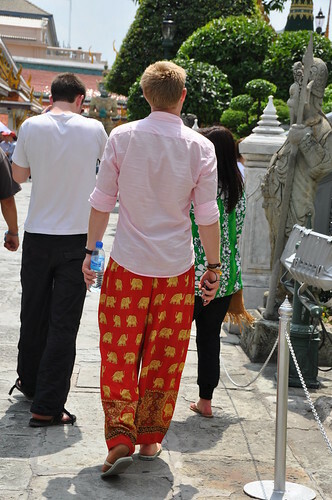 makes me wanna go to bangkok! cant wait. and btw, LOVE THE TITLE!! !